"Chatswood" redirects here. 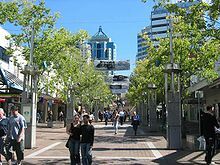 For the suburb of Auckland, see Chatswood, New Zealand. The Cammeraygal people inhabited the area for at least 35,000 to 50,000 years prior to European arrival. Residential settlement of Chatswood began in 1876 and grew with the installation of the North Shore railway line in 1890 and also increased with the opening of the Harbour Bridge in 1932. Chatswood Post Office opened on 1 August 1879, closed in 1886 and reopened in 1887. In 1900, Chatswood was easily accessible by public transport. In 1903 the Council Chambers moved from Mowbray Road to Victoria Ave.
Chatswood has a rich history of artists who have contributed to Australian culture such as poet Banjo Patterson, poet Kenneth Slessor, artist Arthur Murch, cricketer Victor Trumper, actor Ruth Cracknell, and pianist Roger Woodward all of whom have called Chatswood home. Other notable Australians who were educated in Chatswood include cricketer Mark Taylor, former Prime Minister Gough Whitlam, painter/artist Brett Whiteley, opera singer Yvonne Kenny to name but a few. Chatswood was declared a town centre in 1983 and a city in 1989. Chatswood is one of the North Shore's major commercial and retail districts. Many retail outlets are situated along Victoria Avenue and many office buildings are situated along Pacific Highway. The Australian headquarters of CSR Limited, Smith's Snackfood, Abigroup, Carnival Australia, , Pepsico and Carter Holt Harvey as well as offices of Nortel Networks, Optus, Lenovo, NEC, Leighton Contractors and Huawei are located in Chatswood. A number of high-density residential towers are also located in Chatswood. Chatswood has two major shopping centres, Chatswood Chase Sydney and Westfield Chatswood. There are also a few smaller shopping centres such as Mandarin Centre, Chatswood Interchange, Lemon Grove, The Gallery, Victoria Plaza and Orchard Arcade. The Chatswood Mall Markets are held each Thursday and Friday in Chatswood Mall, Victoria Avenue and feature food and craft stalls, and live music. Chatswood has a wide variety of restaurants and cafes and is known as a major dining destination in the Lower North Shore of Sydney. There are a large number of Chinese (including Cantonese), Japanese and Korean restaurants and eateries. There are many hotels in Chatswood: The Mantra, near Chatswood railway station and The Sebel, near Westfield shopping centre as well as the brand new  Meriton Serviced Apartments Chatswood. The Chatswood Club, located on Help Street adjacent to Pacific Highway, is a venue hall which caters to weddings, birthdays, cocktail parties, and other age-appropriate festivities. Chatswood railway station is the junction of the Hornsby via Macquarie Park and Berowra via Gordon branches of the North Shore, Northern & Western Line of the Sydney Trains network. Rail services run south to the Sydney CBD and continue west to Strathfield and beyond. Rail services run north to Hornsby and peak hour services run to Gosford, Wyong and Newcastle. The station became a junction when the Epping to Chatswood railway line opened in 2009, connecting Chatswood to Epping. The Sydney Metro project which is currently under construction will include a stop at Chatswood Station. This project will deliver 65 km of new high capacity metro standard rail line for Sydney. Chatswood is a major bus terminus with services to Bondi Junction, the City, North Sydney, Mosman, St Leonards/Crows Nest, Kingsford, Balmoral Beach, Manly, Warringah Mall/Brookvale, UTS Ku-ring-gai, Lindfield Precinct, Belrose, Narrabeen, Frenchs Forest, Mona Vale, Burwood, Top Ryde, Macquarie Park/Centre, Castle Hill, Norwest Park, Killarney Heights and Willoughby. An interstate bus service between Sydney and Brisbane via the North Coast stops at Chatswood. Major roads through Chatswood include the Pacific Highway, Mowbray Road, Boundary Street, Willoughby Road, Eastern Valley Way and Victoria Avenue. The latter forms a pedestrian mall for the section running through the main retail area. In the 2016 Australian census, the total population of Chatswood was 24,913 people; 11,786 (47.3%) were male and 13,127 (52.7%) were female. 32.4% of people were born in Australia. The most common countries of birth were China 20.7%, South Korea 6.5%, Hong Kong 5.3%, India 3.5% and Taiwan 2.8%. 33.6% of people only spoke English at home. Other languages spoken at home included Mandarin 22.9%, Cantonese 12.3%, Korean 7.2%, Japanese 2.9% and Hindi 1.4%. The most common responses for religion were No Religion 42.6% and Catholic 15.8%. The Willoughby Spring Festival is an annual event in Chatswood, held in September each year. The festival is the second-largest in Lower Northern Sydney and is intended as testimony to a modern, multicultural and prosperous Chatswood. The festival showcases music, theatre, live performances, outdoor events, kids' events and visual arts. Willoughby Theatre Company (formerly Willoughby Musical Society) is based in Chatswood. It specialises in musical theatre. Chatswood Musical Society also performs musical theatre, but their events are staged in Pymble. The Zenith Theatre stages both musicals and drama. The Willoughby Symphony Orchestra is based in Chatswood. Two dance companies share the Dance and Music Centre. A Chinese Cultural Centre has existed since 1996. The Willoughby Historical Society runs the Willoughby Museum in Boronia, a Federation cottage in South Chatswood. A new cultural centre called The Concourse, Chatswood was commissioned by Willoughby Council in 2007 and was completed in 2011. It includes a 5,000 m² library, Chatswood Library, a 1,000-seat concert hall, 500-seat theatre, exhibition spaces, commercial spaces, cafes and restaurants. The Concourse was opened on September 11 by the Governor of NSW, Her Excellency Professor Marie Bashir AC CVO. Chatswood High School (Years 7–12). Originally a boys' school with a Cadet Corps until the 1950s when it changed to a coeducational school. Chatswood Public School (Years K–6). Opened in 1883. St Pius X College (Years 5–12) originally called Christian Brothers. Mercy Catholic College (years 7–12) originally called St Catherine's. Mowbray House School operated in Chatswood from 1906 until its closure in 1954. Church of England Girls' School Chatswood (closed since 1940s). Chatswood Oval is located south of the railway station. Beauchamp Park, located on Nicholson Street, features a playground, an oval, a fenced dog area and a bike track. It was named after William Lygon, 7th Earl Beauchamp, the Governor of New South Wales. In 2015 a memorial to the Armenian community was erected in the park. Another small but well-laid out park, with an industrial heritage theme, is the Mashman Park on Victoria Avenue at Septimus Street. This park pays tribute to the Mashmans brick and tile works that once stood there. Chatswood is close to Lane Cove National Park. July 2016 saw the unveiling of Bartels Park in Chatswood West. Named in honour of the recently deceased former Willoughby Mayor Greg Bartels, the park is the former Edgar Street reserve. The Garden of Remembrance celebrates the fallen men of the suburb who fought in the Boer War, World War 1, World War 2, The Korean War and Vietnam War. The roses were all grown from original cuttings of briar roses taken from the Somme region of France where more than one million soldiers were wounded or lost their lives at The Battle of Somme in 1916. At the very peak of the Garden stands the Willoughby Council Peace Tablet which commemorates the signing of The Treaty of Versailles in 1918. ^ a b Australian Bureau of Statistics (27 June 2017). "Chatswood (State Suburb)". 2016 Census QuickStats. Retrieved 10 October 2017. ^ Premier Postal History. "Post Office List". Premier Postal Auctions. Archived from the original on 19 August 2008. Retrieved 16 June 2012. ^ "Windsor Gardens". New South Wales State Heritage Register. Office of Environment and Heritage. H00571. Retrieved 18 May 2018. ^ "Hilton". New South Wales State Heritage Register. Office of Environment and Heritage. H00374. Retrieved 18 May 2018. ^ "Contact Archived 14 October 2008 at the Wayback Machine." Carter Holt Harvey. Retrieved 28 January 2009. ^ Celebrate 15 years of the Chinese Cultural Centre (NSW) with Explorations, Cultural and Natural, Willoughby City Council Press Release, 23 August 2011.